We are excited to announce the new, colorful line of 2-channel transmitters by Nice Apollo! At just 1.2" x 2.2", the miniature Inti transmitter will fit in your purse, car, and hand with ease. The INTI2/A Inti transmitter uses data processing and recognition systems that increase its degree of security, delivering a threefold reduction in automation response time. This makes for faster opening and closing times, allowing you to get where you need, fast! Do you find programming your remotes and transmitters frustrating? Thanks to the Inti enabling code exchange, you can easily program your transmitter using a transmitter already programmed to your receiver. Each 433.92 MHz rolling code gate remote manages Identity Codes and Certificates and has a self-learning, built-in proximity receiver. With 72 bit O-Code encoding, it is also compatible with Nice FLOR encoding receivers. When activated, the Inti transmitter flashes red. Available in six colors and ideal for multi-user systems, you are sure to find the right INTI2 transmitter to fit your personal style. 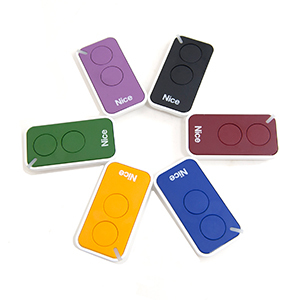 The back side features a scratch-resistant coating, a perk that also makes our gate remote control an elegant, colorful keyring! Select a color below to learn more!